NAAS Edenton, NC was not Fighter town. In fact, there was not a fighter aircraft to be found. 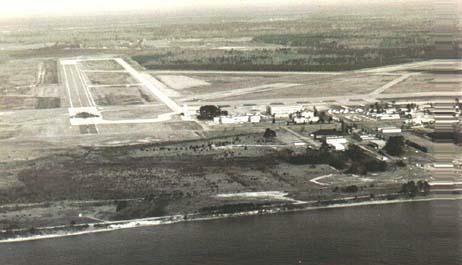 Marine Aircraft Group 14 occupied the base with two Skyraider squadrons, VMA-211 and VMA-225. The required support squadrons and personnel were assigned which brought the total base population to about 1000. The local population plus dogs amounted to a similar number of inhabitants until the Marines vacated the base in 1958-59. In the Fall of 1957, I held several billets at the Station Operations Department. 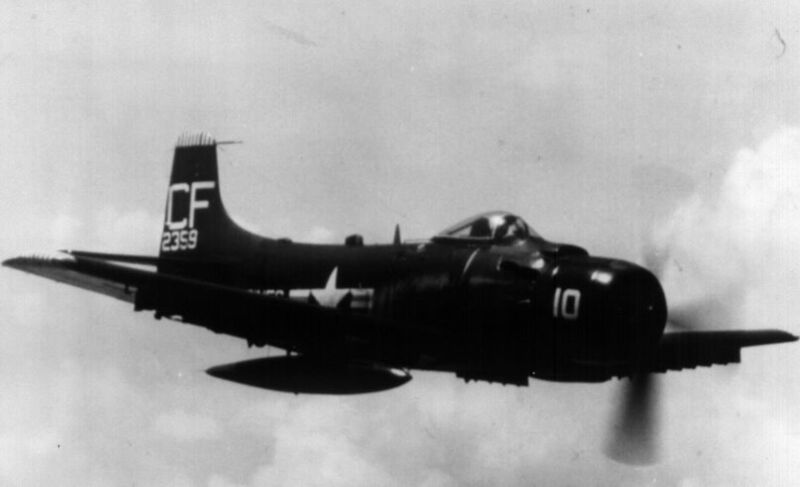 The Wake Island Avengers of VMA-211 permitted me to fly AD-4B's along with the Skyraiders in H&MS-14. Being a typical frustrated fighter pilot, I spent a lot of time looking for jets to jump. I used a K-20 aerial camera to document encounters. 1/Lt. Jack Schlafli was caught on film in his F9F-8 after a hassle. Three times I climbed the Skyraider up to 35,000 Ft. over Norfolk in hopes of dog-fighting some jets. Once, two F4D's were shooting radar intercepts west of Norfolk and I tried to cut them off at my staggering 115 knots indicated. I was using fifteen stages of supercharger and had the fuel leaned to the maximum trying to stay out of buffet and yet be above a stall. They went by me in a head on pass and I turned cautiously into their six o'clock. 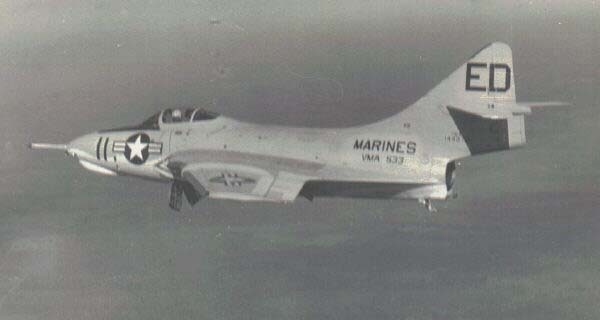 The lead Skyray called Norfolk Radar. "Say, can you tell me what kind of prop aircraft flies at 35 thousand?" The controller said, "I have heard of the F4U flying above 30 thousand." "This was not a Corsair." Responded the Skyray driver. The jets made a right turn back towards my Able Dog. I tried to keep my nose pointed towards them but soon I was at 95 knots and shuddering out of the sky. Then I was descending at 3000 Ft per minute with a nose high attitude. It was time to go home! I shoved the stick full forward to unload the aircraft. Then, I really came down--shaking and bucking through compressibility. All this high altitude action without pressurization! I made a few attempts at the FJ Fury which was the Navy's hottest at that time. One pass, high angle off, compressibility buffet at 30 thousand. They probably never knew that an Able Dog tracked their jets for a fraction of a second. Those were the days! Have fun but stay alive! Many times while flying missions in South Vietnam, I wished that I was flying the durable, armor-plated, high performance, low-altitude, heavy ordnance load, accurate bomb delivery, Able Dog Skyraider ! !